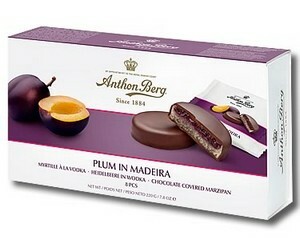 Anthon Berg's unique and delicate marzipan discs with plum jam and Madeira are known all over the world. The discs have a plum jam centre and marzipan soaked with Madeira. 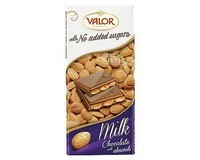 Finally, they are covered with a thick coating of high quality dark chocolate. All the discs are individually wrapped. 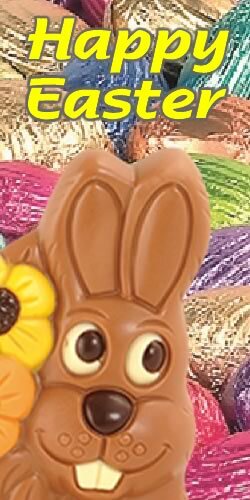 Ingredients: Sugar, plums 15%, cocoa mass, almonds 11%, apricot kernels, glucose syrup, cocoa butter, Madeira 1.5%, alcohol, milk fat, emulsifier: rapeseed lecithin, thickener: pectin, preservatives: sorbic acid, potassium sorbate, citric acid. Minimum 50% cocoa solids. Alcohol: 1.5% ww. May contain traces of other nuts.